Make music on the go with a range of Orange amp sounds. Nice Orange emulations. All the essential amps. Great price. IK Multimedia has partnered with Orange for the release of two new iOS apps, AmpliTube Orange for iPhone/iPod touch and AmpliTube Orange for iPad. 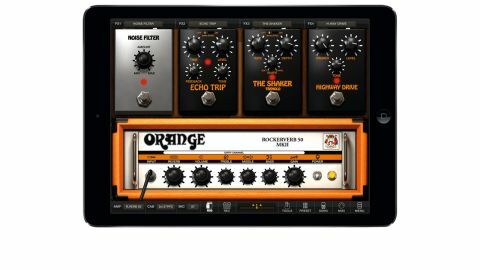 "The app comes with a bunch of presets, so you can dive straight in and start playing"
What you get in this mobile effects studio are five Orange guitar amp models and one bass amp model, each with their associated cab models and with the ability to mix and match any amp to any cab. In addition, you get four effects pedals: noisefilter, overdrive, delay and tremolo, plus a single-track recorder that can be expanded into a multitrack via in-app purchase. The app comes with a bunch of presets, so you can dive straight in and start playing. There are amp sounds here for all styles, whether you favour the more classic sounds of the OR50 and AD30, the higher gain of the Rockerverb 50 MKII or the raucous vibe of the Tiny Terror. There are 36 amp/cab combinations, with two mic'ing options for each cab, and that's before you even start turning knobs. While the effects are generic - Orange doesn't make its own stompboxes - they (plus the Rockerverb 50 Mk II and Thunderverb 200 reverb) greatly increase the versatility and offer extra ambience in your headphones. If you like Orange amps, and a lot of players do, this is an inexpensive way to have your favourite sounds on hand at all times for practice (you can play along to your iTunes library) or recording.